Boxer dog is a super-striking soul full of charm, fascination and grace. Strong look, powerful jaw, noble conscience and impressive companion-ship, all these you can have in your pet, if you have a boxer at your home. An adult boxer is medium-sized with flat body and normally coming in fawn, brindle, with or without white marking and black mask. 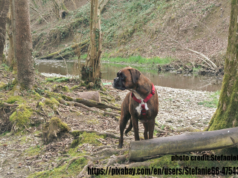 In this article, we’ll describe the distinguished characteristics of the adult boxers along with some caring instructions recommended for keeping the adult boxer dog. The male adult boxer can attain a height of 25 inches and can weigh from about 65 to 80 pounds (30 to 36 kilograms); while the female adult boxers might grow up to 21 to 25 inches and weigh from about 50 to 65 pounds (22 to 30 kilograms). 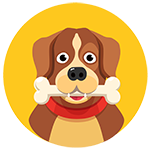 If you need more understanding, all “medium” dog breeds range from 35 to 65 pounds (15.8 to 29.4 kg). But to every case, there could be slight differences in the above said facts. Some adult boxers in both sexes might be a bit smaller or bit larger and it depends upon their genes, diet and circumstances. As per the guidelines laid down by the American Kennel Club (AKC), the adult boxer will weigh around 60 and 70 pounds (27 to 32 kg). They also suggest about the height if it is measured at the shoulder; it will be 22 to 25 inches (56-63 cm). And when it comes to the neck size of an adult boxer; it will be from 13 to 22 inches (33 to 55.8 cm). The most engrossing parts of the body of an adult boxer are obviously its head and jaw. 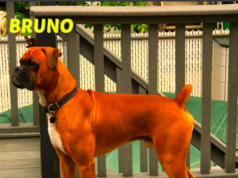 Perhaps these are one of the most wanted traits for a boxer lover, as and when he goes to adopt the boxer. An adult Boxer’s head is actually sized in accordance with the magnitude of their body. And the strength and grip is also related with this. Dark brown eyed Boxer looks really charming as their eyes give notice of agility and passion inside. Additionally, there are ravishing fringes surrounding the eyes that make them more alluring. In the normal conditions, the ears of the adult boxers are falling downwards the cheeks and when he is attentive, the ears standing on the top of its skull are falling from the front. With reasonable flexibility, the neck of an adult boxer is sturdy and athletic. There is also a unique arch which travels till the low parts of its body. The front legs and adjoining parts are also dynamic and give a persuasive look. They have fantastic and artistic rib-cages and they possess a deep chest. The back of an adult boxer is well-shaped and really muscular that adds to its beauty. Although the back is shorter than other dog species and it is sloping towards the hind legs and adjoining parts of its quadruped. The feet are also short and having the arched toes. To somehow, they resemble like a cat’s feet. The back-feet are slightly larger than the front ones. They have a straightened and standing tail and they always dispose them high. The coat whichever colour is that; fawn or Brindle with white markings, white with or without marking, fawn with light shades or brindle with stripes, as it is always sting to the body, it gives a tremendous and shiny look. The markings are known as flash, which normally spread over the neck and facial parts. Such dogs are known to have flashy coats. 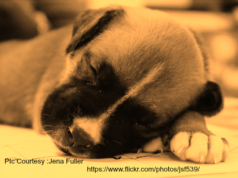 Although a young boxer takes time to be mature and adult, they develop their compatibility with humans very fast. They are also known as entertainers for their intelligence and genius. They are usually socialized animals which adopt the training tactics very easily. The adult boxer is known for its playful nature. The ideal diet for an adult boxer should contain a mixture of meat, vegetables and the food ingredients having carbohydrates. Although it is recommended, the adult boxer to be fed in accordance with its weight. It is also to be remembered, the adult dog needs at least 2-3 hours to digest its food. Some owners neglect this fact by feeding them with normal human food which might sometime be having excessive calories and it can be harmful for their digestion. The adjustment and alteration in the diet schedule should also be made by keeping a keen observation on the weight of an adult boxer and it should be relevant with the physical activities conducted by him/her in the daily routine. If an adult boxer is given the right guidance from its young age, it can prove itself to be a truly faithful and subservient. Their temperament can be further evolved and refined, if they are provided with the efficient training. They might be sometimes attackers to the stranger and other neighboring pets if are left wandering freely. They also require the regular exercises to maintain their fitness. But overall, the adult boxer is adaptable to the new environment and it can be soon mixed up with their new owner or keeper. They are also having the loving and affectionate attitude towards the children due to their playful instinct. Sometimes, the adult boxer may be more vocal and frequent barker, but there is always a reason for that, so attention to be given in such case. 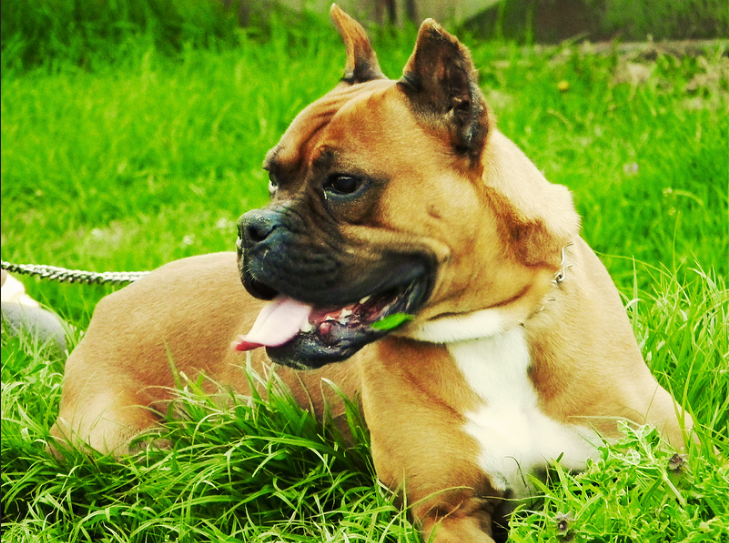 Over-heating conditions are not suitable for the adult boxer, so it should be avoided. Their environment plays a vital role in the development of their personalities. As they possess shorter coasts, the excessive colder environment is also not suitable for them. Is there a particular brand of food I should be feeding my boxer. She is 8 years old. I started my boxer, Boston and Frenchton on raw about 2 1/2 weeks ago from pet planet and my boxer got really sick at the end of the 2 1/2 week mark vomiting badly with diarrhea. A neurologist looked at the picture I took of one of her poops which was a burnt red color . It came out like water. He thought it was colitis. She’s on chicken and rice right now but I need to know what is best to transition her onto for life. Before the raw my boxer and Boston were on Natural Balance sweet potatoe and fish but they both had acid reflux. I’ve been looking into dehydrated , raw and homemade food. Any help would be very much appreciated.